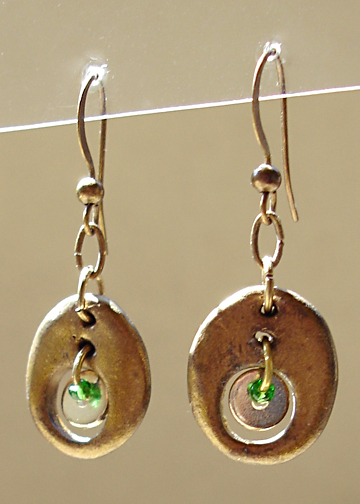 I wanted to try something a bit different and create some earrings with a cutout in the center. To make things a bit more interesting, I thought it’d be nice to have something hanging within the cutout. This would add some movement to the earrings. They are a simple shape, but it proved to be a bit more difficult than I estimated since these are fairly tiny in size. The round piece is about 5/8″ in height and the cutout is a quarter inch in diameter. They’re sculpted from polymer clay with a metallic antique gold powder finish. So, fitting the jumping, silver washer shape and the tiny green glass seed bead were pretty tricky! But after a little bit of wresting with them, I was able attach it all inside the earrings!